The school provides a vibrant and purposeful learning environment for students. The air-conditioned classrooms are well equipped with modern, sturdy furniture and a good range of relevant resources. Teaching areas are uncluttered and well-ordered and students have access to individual work stations if this appropriate for them. 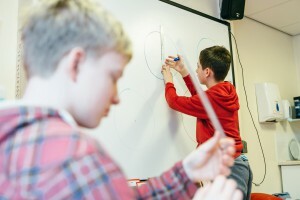 Four of the teaching areas are equipped with interactive whiteboards, and the fifth classroom is geared towards practical activities and life skills development. All classrooms have computers and internet access and students are encouraged to use these for learning and leisure. Staff work closely with the therapy team to use technology to develop each individual’s motor, communication and ICT skills. The curriculum is broad and takes full account of the national curriculum programmes of study for KS3, KS4 and post 16 students. Activities are matched closely to the students’ needs as identified in their Individual Education Plans (IEPs), and there is a strong focus on the students learning through practical experience so that their learning has meaning. Educational visits are a crucial and integral part of the curriculum as are regular, planned home management tasks. Students engage in regular physical activity through weekly P.E. sessions, trampolining, swimming and horse-riding at a nearby stables. Students are exceptionally well supported by an experienced and well trained teaching team. 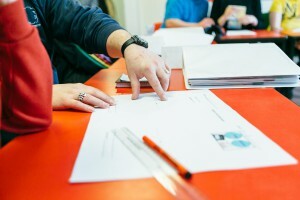 The teaching staff have been trained in PECS and TEACCH and have extensive experience of teaching students with autism and in managing the challenges that face the students. Each classroom is headed up by a teacher. Students usually work in the same group with the same teaching team. The familiarity with their surroundings and the adults who are working with them help to reduce students’ anxiety so that they can learn more effectively. The teaching team is headed up by the Head of School. Teaching areas are bright and cheerful, and are enlivened by displays of the students’ work. The Shires follows a TEACCH approach to learning and students can access their own individual work stations where they can concentrate on independent tasks as well as working in small groups and pairs. 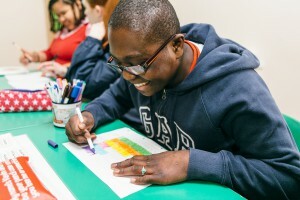 Students are supported by a well-qualified team of specialists, including a speech and language therapist, an occupational therapist, a music therapist and a clinical psychologist, who work with the core teaching and care staff to develop individual programmes to extend the students’ skills. Therapists train core staff so that therapeutic programmes are consistently followed in the care and education settings. An educational psychologist regularly visits the school, working on individual programmes with students and helping staff to develop meaningful behaviour and care programmes that advance the students’ skills, self-knowledge and independence. Students coming to The Shires are often referred to the school because of the problems they have in maintaining and controlling their own behaviour. They often have little social understanding and do not understand the rules that govern society and community living. Many do not have empathy and they find it difficult to understand their own emotions and the emotions and feelings of others. The behaviour of some of the students is unpredictable and can sometimes be aggressive and destructive. Staff work closely with professionals to devise appropriate positive behaviour management plans which focus on the positive achievements of the students and which help them to effectively manage any challenging behaviour. Staff spend a great deal of time observing students and analysing patterns of behaviour so that triggers can be identified and so that appropriate and effective de-escalation strategies can be put in place. Generous levels of staffing mean that students who have extremely challenging behaviour can be well managed and supported. All care and teaching staff receive BILD-approved positive behaviour management training. Students are encouraged to be as independent as possible and are provided with plenty of opportunities to learn about things that matter in day to day living, such as shopping, eating out, handling money and acquiring life skills. They are supported in this by timetables that give them a clear picture of the day’s activities and individual activity schedules that break key tasks down into small parts, which the students can more easily manage and master. The students’ academic, personal and social achievements are celebrated and praised so that students at all levels have high levels of self-esteem and confidence. The students’ spiritual, moral, social and cultural development is strongly promoted through the many daily activities that are on offer and through planned visits to a wide range of diverse places of interest. Whole school assemblies provide an excellent opportunity for all staff and students to join together as the school community and are thoroughly enjoyable occasions. Students have weekly PSHE lessons where they learn about personal hygiene, practise their skills of shopping, cooking, preparing drinks, and explore environmental and social topics. Students have regular access to a purpose built ‘life skills’ kitchen where they prepare snacks, learn how to operate the washing machine and carry out food technology activities. Students have a great deal of involvement with the local village community through a range of projects, such as litter picking, cleaning the village bus shelter, hanging bird feeders around the village and delivering the parish newsletter. Local businesses support the school very well, and are keen to do what they can to develop the students’ awareness of the world of work. People from surrounding villages are welcomed at school open days and school performances. Parents and other family members are fully involved in the life of the school. Home school books provide a useful way of sending information to and from school for those students who do not live at The Shires. Parents are always welcome to come into class to work alongside their children or simply to observe from time to time. The school seeks to involve parents in school projects and events such as the ECO schools activity, the development of the school gardens and school events and concerts.